Get real, detailed that is. The pro-line insert has plenty of details such as roll cage, steering wheel and of course a fully outfitted driver that will make your rig come to life. The pro-line kit comes clear so you can paint it any scheme you want. The Tamiya insert comes in an easy to paint lexan like white molded plastic. I know I’ll be including this on my next SCT body, so go a head add a little scale appeal to your next project. Or add this to an existing project for a little modification. It will make the guys at the track turn their heads too. Other added details can include L.E.D.’s, outside mirrors, exhaust pipes and mock turbo inter-cooler. 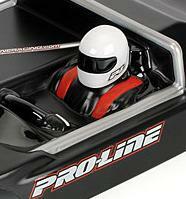 Such companies like Tamiya, Pro-Line Racing, HPI and RPM Racing have a variety of scale goodies for any RC application.